Traditional vending machines require cash before providing folks with a tasty beverage. 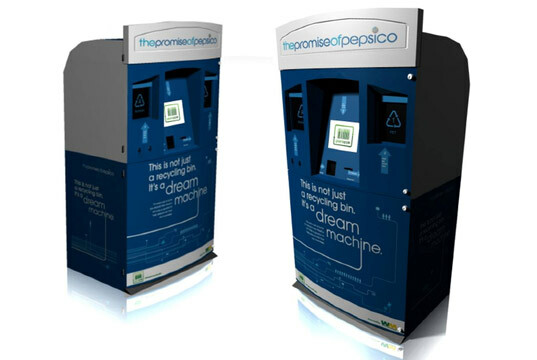 The Dream Machine, a new type of vending kiosk, embraces a much cooler concept: It gives you points and prizes in exchange for an empty bottle or can. Organizers hope the reverse vending machine will encourage recycling when people are away from home and without access to a convenient recycling bin. The computerized recycling centers were created through a partnership between Pepsi, Waste Management and Keep America Beautiful and are manufactured by GreenOps. To use the machine, people can just scan the barcode of their empty PET plastic bottle or aluminum can, and then insert it into the slot. The Dream Machine calculates how many points to dole out for that particular container. Points can then be redeemed for prizes at the host venue or on Greenopolis.com. Currently, the Dream Machine can only be found in 150 North Carolina Rite Aid stores, but Southern California will install about 3,000 of the devices by the end of the summer. Organizers say they plan to roll out several thousand of the machines across the country throughout this year. 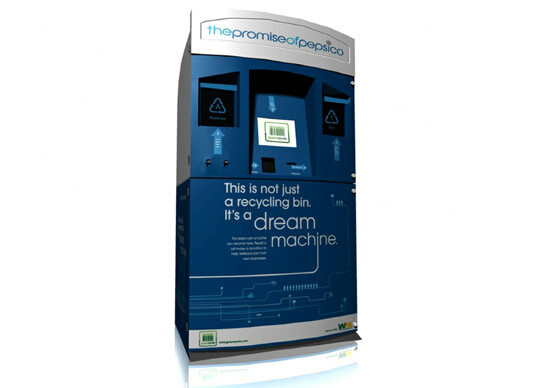 Waste Management will work with the non-profit Keep America Beautiful to find ideal locations for the Dream Machines. Once the machines are more widely dispersed, organizers say the goal is to recycle 400 million containers a year. To: Sarah Parsons on www.Inhabitat.com From: Cammi Garrett; 9:00am Subject: Date: October 18, 2016 I love this idea of reverse vending. The way we have treated our planet over the course of history is shameful. By throwing trash on the ground and discarding plastic all over the earth, we have caused terrible things that affect our environment and the creatures in it. With this act of carelessly discarding our used plastic bottles on the ground, we have inadvertently created the, so called, “Trash Island”. Most of the animals in our food chain and ecosystems are either landing on or swimming by the island, and when they do, they eat the trash without knowing that to them, it’s poison. When the animals do this, if they don’t die first, they most likely end up on our plates as food. The animals don’t know that what they see isn’t food, but we do. Now I don’t know about the other people on Earth, but I certainly do not want to eat something that once had a stomach full of plastic and other waste. That’s why I believe that these reverse vending machines are a good idea. Having a place to quickly “dump” our plastic bottles didn’t seem to be enough to get people to recycle, but adding a reward to the process is a sure way to get people interested. In all of my 17 years of experience as a human on this earth, I have come to find out that many people in this world are self-seeking. Basically, if there’s not something in it for them, they won’t be willing to do it. So by creating an incentive for people to recycle, they are most likely going to do so. I mean, who doesn’t like to earn prizes. I certainly do. All these major problems happening to our animals and planet could have been avoided if the people on this planet had just taken the time to recycle in the first place. It saddens me to see the abuse and disregard for our beautiful planet. That being said, I can’t wait to see one of these Dream Machines in my town. If you like above, you may want to see a video showing a Laptop Vending Machine: http://www.youtube.com/watch?v=zA3MvbBGz6E From company called LaptopsAnytime (www.laptopsanytime.com). Can this machine pay cash to the user instead of points [then they have redeem at particular venue]? Coz people will prefer cash back instantly. Can this machine be use in other countries, like Malaysia? Thank you. Does anyone have any idea how to get one of these? I work for a large health care company and I think that these could assist with recycling efforts. Isn't it better than just forget about what will happen to the bottles/cans ? Points or cash , ounce they are "friendlier" looking ,& designed, why not even have a little one at home ? This is not exciting at all. I remember using recycling vending machines to collect bottle and can deposits as early as the 1980s, in NYC at least ... and I noticed similar machines still in use in Westchester Co. during my last visit. Maybe Pepsi should lobby other states to introduce similar deposit programs. Don\\\\\\\'t you guys have paid recycling yet? In Norway we\\\\\\\'ve had this for longer than I can remember. We get 1nkr for a 0.5l bottle, and 2.50 for a 1.5l bottle (this translates to 16¢ and 42¢). The value is a bit outdated, yet we are still some of the best at recycling plastic. Check out http://www.tomra.com/ (as they are the makers of your reverse vendors). Of course, with Michigan's bottle and can deposits, we've had machines like this in every grocery store for years, now. And those are worth 10 cents each, rather than just points for prizes. I work for a Strong Vend a vending machine supplier in the UK and this looks like a really cool idea. Hopefully they are succeful and they will expand to the UK. I will be keeping a close eye on how this progresses. No. this is NOT cool at all. This is another way for Pepsi to justify selling plastic soda bottles. It will make people think it\'s ok to buy Pepsi as long as they can recycle! Another marketing gimmick! Total greenwashing.